Britain's cleaning industry is worth £9bn - but the immigrant cleaners doing our dirty work are increasingly living in a secret world of abuse, intimidation and illegality. When they come around to your desk and empty your bin, do you look up, smile and say hello? While Britain has an army of foreign cleaners, it's a hidden army that most of us rarely see. As office workers switch off their computers for the evening and brush the sandwich crumbs on to the carpet, cleaners from around the world are just arriving. While we sleep, they clean. And this strange world is one of the realities of modern immigration. Our decision not to clean our own loos has led to massive change as Britain's economic strength pulls in people from around the world willing to do the job for us. A glance at this website's Born Abroad project, published earlier this month, reveals that much of the new immigration to Britain is to low-paid jobs from areas like South America and parts of Africa with no historic ties to Britain. It is these people who, mop in hand, are keeping our floors clean. But according to cleaners who were prepared to speak to a BBC documentary, this is an industry increasingly "run on fear" as migrant workers find themselves exploited by unscrupulous contractors. Thomas, from Ghana, said he worked 75 hours a week on minimum wage to make money to send home to his family. On the day of the London bombings, he followed police advice to stay at home. His supervisor subsequently gave him a "punishment" of just cleaning toilets - 72 a night in the central London office block where he works. When he complained of back ache, his supervisor ordered him home without sick pay. Those who have campaigned to improve conditions have had mixed results. 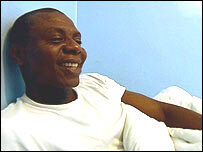 Abdul Durrant, one of the British cleaners still in the business, led a campaign to improve pay for cleaners at a bank's headquarters in Canary Wharf. Others however have found themselves losing their jobs for complaining. Matthew Bolton of campaigning group London Citizens says that cleaners are not part of the world that most Londoners recognise. His organisation's investigations into conditions often hit a brick wall, he says. 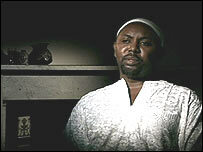 When the BBC followed Matthew's team handing out questionnaires to City cleaners, office security guards ordered the producers to stop filming. "They're hidden in terms of the time [that they work] but also the sub-contracted processes of employment," says Matthew. "They are not directly employed by the bank that owns the office block; the bank employs another agency that employs them. "They're one step or two steps removed from the original employer so it's very difficult to build up a picture of how many are working, in what conditions because you can't go to the bank because they simply don't know. "There is a lot of secrecy around who is working and under what conditions they're working. "Whoever you go to at whatever stage of this subcontracting chain, they don't want to tell you. So you go to the cleaners at the bottom of the chain and tell them that you are campaigning for better wages but what you get is fear - fear of intimidation." Although many workers are legally resident, some are not. Illegal immigrants, either people who entered on false papers or over-stayed a visa, are a key group in the cleaning industry. Competition for lower and lower costs - and the determination of some to come to work in London - has led to illegal migrants increasingly being found in cleaning jobs. Once here, many find cleaning jobs through supervisors from their own countries who are charged with finding staff for the cleaning company. The situation is very similar to some of the problems facing foreign labour in agriculture. Mary Schramm has been in the industry for 30 years and trains cleaners at London's Merton College. She says she has witnessed the growth first of migrant labour and now of illegal workers. "If these illegal immigrants were suddenly deported," says Matthew Bolton, "then the Tubes would be a lot dirtier, maybe the bin wouldn't be emptied and the stuff you left on your desk would still be there." The Secret Life of an Office Cleaner will be shown on BBC Two at 2100BST on Monday 19 September. Cleaners play a very important role in our lives, therefore the should be treated and given the respect and the salaries they really deserve. Without them we would be living in a dirtier planet. I think it's about time we started realising that we really need them. My partner moved to the UK earlier this year from Poland and has subsequently been cleaning for an apartment letting company that charges its clients over £1000 per week for a 2 bedroom pad. My partners' "part-time" hours regularly exceed 10 hours per day as she is paid "per apartment"; this means that the company does not take into account the time it takes her to clean the company office first thing in the morning, travelling between apartments on opposite sides of the city, taking the cleaning equipment back to storage or the extra time taken to clean a property after particularly dirty clients. It amazes and disgusts me how unscrupulous and unethical companies are able to get around the minimum wage laws by paying piecework like this. The poor economy, high unemployment rates and degree of corruption in Poland (and I'm sure in many other developing ex-communist countries too) means that many of the people trying to find work in the UK are doing so because they have absolutely no alternative if they are to improve the quality of their lives; to find themselves then being mercilessly exploited by one of the richest countries in the world must be soul-destroying. In my experience, the immigrant workers that I have had the pleasure of knowing have, almost without exception, all worked harder than any native UK resident I know, for a fraction of the pay and benefits. Bearing this in mind, it is unsurprising that many groups of non-native UK residents end up coagulating into communities that often have very little knowledge of British law or culture (whatever that is now!) and many remain unable to speak more than a few words of English due to lack of contact with people outside their extraordinarily long working hours - how many of us feel like making the effort to go out and "integrate" after a 12-14 hour day? Personally I think the people in the western societies have become more lazier than 50 years ago when it comes to putting in personal effort to do those little labour intensive tasks, in keeping your place of work, public areas and streets clean. 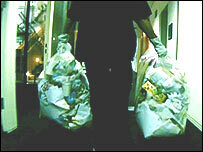 Most people tend to think that's the job left for the hired cleaners, the council cleaners or the garbage collectors. But is there a justifiable pay rate for these workers ? While these illegal immigrants get paid peanuts for their long hours and the street cleaners or garbage collectors get ripped-off by the council with our council-tax moneys, their will always be hard labour exploitation of these poor people! When I was a young father of two back in the 70s I had a full-time job but moonlighted in the evening for extra money by sweeping factory floors and cleaning the sinks and pans in the toilet areas. The work was relatively easy in terms of energy expenditure and hardly taxed the brain, but even then there was a type of stigma attached to the job and I was rarely acknowledged by the factory's full-time workers. What it did for me though was give me an appreciation of how vital the work is and how little the people who do it are appreciated. Without them businesses wouldn't be able to operate to their full potential. So that's why I always make a point of chatting to the cleaners whenever I'm working late in the office and finding out their names. We'll then spend a few minutes talking in generalities about our families, interests and what's going on in our lives. In other words we do what any work colleagues would do because, at the end of the day, that's what we are - aren't we? If Japanese school children can clean their own classrooms why can't our children do the same? And why can't office workers clean their own work stations at the end of the day? I certainly wouldn't object to doing this. Most of us can do our own typing and easily survive without secretaries. Five minutes at the end of the day with a duster and polish, a communal waste bin and a weekly Hoover would not be a problem. I think it is terrible how some people treat cleaners as "lesser beings" than them. It comes down to sheer manners of some people. I always chat away to the cleaner unlike some people who treat cleaners like dirt. They are doing a worthwhile job and I agree cleaners should be paid more. At least they are doing a job and not sitting "sponging off the government. It only takes 2 seconds to say hello. Whilst I have no knowledge of the abuse or the working conditions of these immigrants (I look forward to the documentary), I do feel that the perception that middle-class white (collar) workers have of ethnic minorities (at least in Ireland, a country that is going through an ethnic influx similar to that the UK experienced in the 1950's) is surely tainted by the context of our exposure. Like many people in Dublin, I can hardly remember speaking to a Chinese person who wasn't serving me a chicken roll, a Pole who wasn't cleaning my desk, or a Nigerian who wasn't handing me a tissue in the gents. Although I don't have the answers to this issue, I can't help but feel this exposure ISN'T ethnic integration. These people must barely have enough money for food and shelter, and certainly can't have more than 2 spare minutes to themselves each day. This is nothing short of slavery. I think it is great that they get to have a job. Perhaps if certain workers are unhappy, they should find another job. There is always domestic cleaning and many other jobs available. As immigrants, they did actually choose to come here and choose to take that job. I don't understand where the problem is. I work as a facilities management consultant and buy significant amounts of support services for clients. However whereas the bottom end of the supply market is rife with bad practice and workers who have an immigration status which is dubious at best there are a large number of highly reputable companies who pay operatives above the minimum wage and also provide a genuine career path for their people. It is important however when buying cleaning or any support service to focus on value not cost. A cheap service with staff paid the minimum wage never, in my experience, delivers an acceptable quality of service. Overall responsibility for the conditions, the low pay and the intimidating atmosphere in which these people have to work must lie with the large companies in whose premises they carry out this work. The fact that ¿middlemen¿ companies do the hiring and firing (and all the unsavoury behaviour that tends to goes with it) does not excuse the actions of the corporates in driving down the costs of contract to levels which they must know can only result in the inhumane treatment of the workers; if they don't accept this then they are either ignorant or arrogant (of which there is no excuse for either). On the issue of ¿outsourcing' services such as this my experience is that the company will usually end up with a much lower quality of service than what they would if the employment was handled in-house, and usually at a higher cost in the long-run; short term gain for long term pain, wise up and look around at all the failings, employ people direct, treat them with respect and you will have a far happier (and as a result more productive) set of people working in your company. When you visit the City, you need security passes to get in to every office building. Yet if I were an illegal immigrant, I'd probably have the run of the place at night. So are all the security precautions just for show? And what about the big firms who make a lot of play about "corporate and social responsibility" - by effectively employing vulnerable people at poverty level wages, don't they show their real colours? If they ignore the issues & blame their sub-contractors then they are no better than 19th century mill owners. I heartily agree with highlighting this issue. Whilst there is a need for all companies to deliver "Best Value" they have created an underclass from which it is impossible to escape because of economic and stereotypical pressure. It is a stark contrast from those who are over paid vast sums of money and bonuses whose contribution to companies and society in general is often questionable. There is very little scope for a cleaner to become a clerical administrator or manager even if they have the necessary qualifications. How strange that support services such as HR, marketing, IT and administration are prioritised over cleaning. In this country we seem to stigmatise manual jobs. Whilst a person might not need any qualifications or training to be a cleaner, they should be entitled to the same benefits and job security as the people whose mess they clean up. I work for a large investment bank in the city and it enrages me to see support staff so shoddily treated. I always try to be polite and courteous but what good does this do - they need better working conditions and more protection from the companies they work for. The bank continually refuses to get involved in anything like, after all it does it's bit by nominating a 'charity of the year' and that let's them off the hook for all other employee misdemeanours. Is the use of predominantly immigrant labour because there is lack of interest from local sources in these jobs ? If yes is it because of the abuses in that job, or because its seen as beneath them ? The trouble is that companies are sub-contracting, and therefore absolving themselves of responsibility...and probably turning a blind eye (its easy too when you don't actually see those people who clean - more so that security guards, etc who you would have a better chance of seeing.